Because he had been playing alot of minutes before the break, Yao requested that Western Conference coach Byron Scott play him limited minutes in the All-Star game Sunday night. Scott obliged by letting Yao just play 13 minutes. 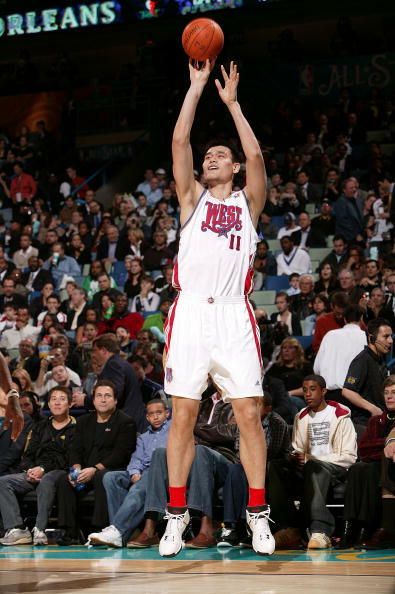 Yao scored 6 points on 2-of-5 shooting from the field, including 0-for-2 from three-point land. I ended up going to New Orleans for the afternoon (didn’t attend the game) and have some interesting non-Yao stories to share. I got in so late, though, I’m pretty beat to write about it now. But I’ll post some of those stories on Monday. Meanwhile, Raymond and other YaoManiacs has done a great job posting tons of cool photos in the YaoMania! forum from the weekend. Click here to see the page (#2 in the thread) with photos of Yi Jianlian, as well as Yao watching the Rookie-Sophomore game Friday night. Click here to see the page (#3 in the thread) with photos of Yao at the All-Star practice on Saturday, and cool photos of Dwight Howard during the slam dunk competition (as well as other participants from All-Star competitions on Saturday night). Click here to see the page (#4 in the thread) of photos from the NBA All-Stars China Night attended by Yao, Dikembe Mutombo and Yi Jianlian (among others). Scroll down this page to see Yao in the locker room on Sunday before the game. Click here for the page (#5 in the thread) of photos of Yao playing in the All-Star game Sunday night. Thanks for the pics Raymond and folks! This entry was posted on Monday, February 18th, 2008 at 12:46 am	and is filed under NBA All-Star game. You can follow any responses to this entry through the RSS 2.0 feed. Man, too bad Yao didnt play longer. I was really looking forward to watching him have a big game. oh well, I guess it is better for him to get some good rest in. He will definitely need it the way he has been logging those minutes this season as well as the upcoming Olympics in his home country. I was hoping he would jack up the halfcourt three though,haha.